Ojo del Desierto, Eye of the Desert, was completed by January of 1925 as the winter home of oilman Thomas O’Donnell and his wife, Dr. Winnifred Willis Jenny, a well-known Long Beach osteopath. Now known as the O’Donnell House, Ojo del Desierto was designed by architect and artist William Charles Tanner and built by Alvah Hicks as supervised by Nellie Coffman, owner of the Desert Inn. The Mediterranean Revival-Monterey two-story residence remained the highest mountainside home in Palm Springs until the 1960s. The O’Donnell House was built with four bedrooms and six fireplaces. The 4,200 square-foot home was constructed on 15 acres of land leased from the Desert Inn for 25 years with a subsequent 25-year renewal. This unusual arrangement was the first Palm Springs land-lease, behind which lies an interesting tale. 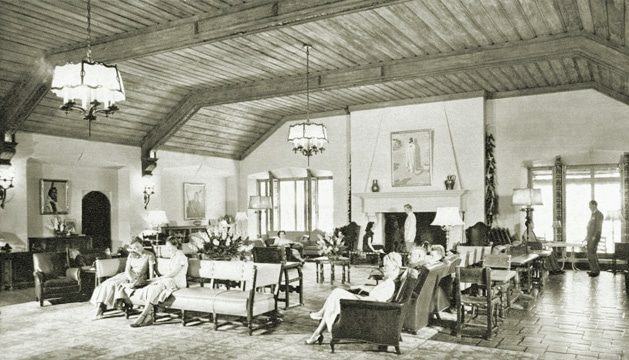 Multimillionaire Tom O’Donnell had come to Palm Springs in the early 1920s seeking relief from a respiratory condition. He stayed at “Mother” Nellie Coffman’s frame-sided boarding house where he enjoyed her well-known hospitality. A friendship and feelings of mutual trust and respect ripened into an advantageous business arrangement. Nellie’s wish to rebuild and expand in the then popular “California Spanish” style and Tom’s desire for a separate permanent home, one that possessed all the advantages of Mother Coffman’s hospitality, resulted in a deal. W.C. Tanner would serve as their joint architect, Nellie as the building contractor and straw boss, and Tom as the financial underwriter. While Tom and Winnifred wed and honeymooned at the Willard Hotel in Washington, D.C., construction on both the Inn and the “Eye” began. Nellie would not sell the land to Tom for his “Eye on the Desert,” but she would agree to lease him the land for a total of fifty years, after which the property would revert to the Desert Inn. Access to the property was confirmed by an easement across Desert Inn grounds. In order to oversee and complete construction for the 1925 winter season, Nellie, who was then almost sixty, made two round-trip hikes daily up and down the treacherous trail. Upon their return, the O’Donnells were delighted with their magnificent residence, which in 1928 was the subject of a feature article in House Beautiful magazine. The house was intended to be private for the family. The kitchen was small and major meals were taken at the Inn. Evening entertainments were plentiful and dinner was generally followed by bridge with guests or friends from the village. No swimming pool was built outside the house, as the Desert Inn’s pool lay at the base of the “Eye of the Desert.” Both O’Donnells preferred playing golf to most any other amusement. The front yard of the house was actually the course through which the driveway ran before reaching the ascent to the house itself, which had a far-flung address to the north of the course off Alejo. The O’Donnell’s wintered at the “Eye” for fifteen years until Tom’s heart condition precluded his use of the stairs. It was decided then to build a smaller one-story home on the golf course so that he might continue to be a part of the game by looking on as others played. It was in that residence, now the Club House, that Tom suffered a heart attack at the age of seventy-five. He died in a Los Angeles hospital and is buried at Forest Lawn cemetery in Glendale. The promontory rock wall to the north of the O’Donnell House was to be his burial site and had been constructed as a make-work project during the Depression to give locals a job. Tom had paid $2.50 a day for anyone in need to stack stone in order to construct its massive walls. Inside these walls is a crypt in which he had intended to be buried. California law, however, forbids burial on private land. Subsequently, the O’Donnell House would become the winter residence of Nathan and Virginia Milnor. After Mrs. Milnor’s Death, the house became the possession of Home Savings, purchased by W.H. Ahamanson along with the Desert Inn, and in 1978 it was acquired by the Desert Museum. For several years, the house was used by the Artist’s Council, known as Hilltop Studio. Workshops, exhibits, demonstrations and receptions were held there. Since 1993 it has been in private ownership. In 2000 it was acquired by the present owners who began its restoration to its original glory. The City of Palm Springs recognized it as a Historic Site in 1986 and in 2000; and in 2010 it was nominated to the National Register of Historic Places and the State Office of Historic Preservation adopted the resolution recommending it be listed. In 2011 it was included on the list.